Join the AIA|LA Committee on the Environment (COTE) on a trip down the Southern California Coast for two exclusive tours of 2017 AIA|LA COTE award-winning healthcare facilities. Attendees will first meet in La Jolla for a tour of the J. Craig Venter Institute lead by architect Sean McGreal of ZGF and J. Craig Venter Institutional representative Dr. Robert Friedman. After the tour, participants will enjoy free time to relax and enjoy the beach-front town of La Jolla Village. We recommend lunch at one of the local eateries, world class shopping, or a walk to the beach. 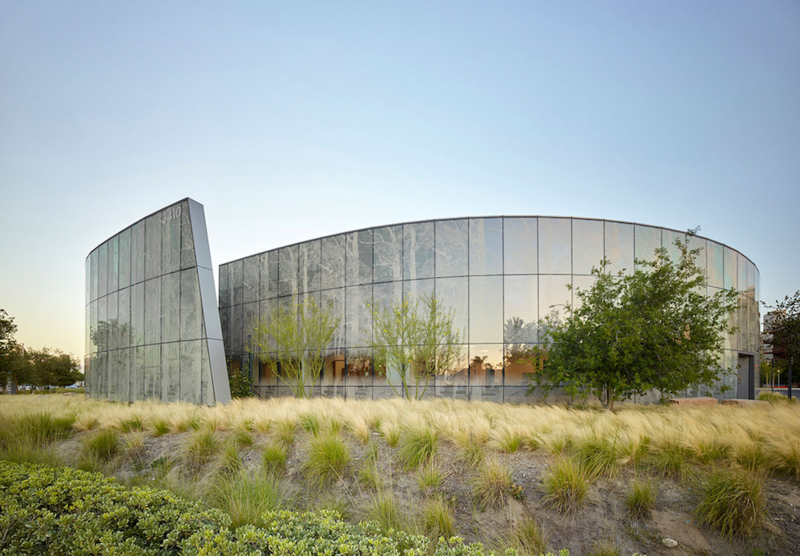 The tour will continue as we travel north to Anaheim for a tour of the stunning Kaiser Permanente Kraemer Radiation Oncology Center, lead by the lead architect from Yazdani Studio of Cannon Design. Tour attendees will be responsible for their own transportation to the tour. Overlooking the Pacific in La Jolla, the J. Craig Venter Institute is a LEED Platinum® facility designed with a net-zero energy footprint, and is one of the greenest buildings in the country. ZGF designed this 44,607 SF building, which is comprised of laboratory and office / dry research space above a partially below-grade parking structure, in response to the client’s challenge to have a building that generates more energy than it consumes. The J. Craig Venter Institute is a leader in genomic research, with a commitment to environmental stewardship. The LEED Platinum® facility has been designed with a net-zero energy footprint, and is one of the greenest buildings in the country. The team’s holistic approach to design revolved around energy performance and water conservation. To reduce energy loads and optimize the mechanical system, the computational laboratories and administrative spaces are located in one wing, and wet laboratories occupy the other. Ground level wet laboratories utilize an easily reconfigurable “plug and play” casework system that encourages transparency and creates an environment that can be rearranged overnight. The dry wing provides open and private offices, formal meeting areas, temporary visitor stations, and informal open modular seating to support administrative and research activities and to foster collaboration. Two arrays comprising 26,124 SF of photovoltaic surface are predicted to exceed the building demand, pushing excess power generated back into the grid. The systems have been refined to be completely integrated and work together to achieve the energy performance goals. This project was one of the AIA COTE Top Ten Projects in 2016 and received an AIA|LA COTE Awards Honor in 2017, among many other honors. Sean McGreal has 17 years of professional experience in the design of academic, residential, judicial, research, and office facilities, as well as historic renovations. As a designer, he is responsible for the quality of design and documentation throughout all phases of a project, beginning from conceptual design through construction administration. Growing up in rural West Virginia, his experience of man-made structures interacting with Mother Nature inspired his love for design and the way the esoteric notions of beauty can be integrated with the rationality of engineering and high-performance features. He works closely with clients, such as the University of California, Los Angeles; Soka University of America; Arizona State University; The University of Arizona; Children’s Hospital Los Angeles; the J. Craig Venter Institute; and the Judicial Council of California, to ensure that each design is efficient, resilient, and cost-effective. Sean holds a Bachelor of Architecture from the University of Tennessee, Knoxville. Robert Friedman directs JCVI’s Policy Center, helps to facilitate JCVI’s affiliation with UC San Diego, and is also active in several projects ongoing in the Institute’s Environmental Genomics Group. Prior to joining the Venter Institute, Friedman was Vice President for Research at The H. John Heinz Center for Science, Economics, and the Environment, a nonprofit policy research organization that brought together collaborators from government, industry, environmental organizations, and academia. Earlier, Friedman was a Senior Associate at the Office of Technology Assessment, U.S. Congress (OTA). For 16 years, he advised Congressional committees on issues involving environmental and natural resources policy. Dr. Friedman received his Ph.D. from the University of Wisconsin, Madison, in Ecological Systems Analysis, concentrating in ecology, environmental engineering, and systems analysis. He is a Fellow of the American Association for the Advancement of Science. LEED Gold, the Kraemer Radiation Oncology Center acts as a gateway to the new Kaiser Permanente Anaheim Campus. The exterior glass facade enhances the building’s sculptural form and creates an interior/exterior connection with a custom glazing pattern that mirrors the surrounding landscape. The glazing pattern density is varied to provide transparency where desired and privacy where needed. At night, the building emits a warm glow—acting as a beacon of hope for all those touched by cancer. Our design approach focused on the distinct needs of cancer patients and their treatment schedules, which typically occur five days a week for five to eight consecutive weeks. To alleviate the stress and anxiety that comes with treatment, we harnessed natural light, views to nature, and soothing interior colors to create a calming and nature-oriented experience that feels more like a spa than a diagnostic and treatment center. The three linear accelerator treatment rooms are located at the heart of the building, enclosed within three-foot-thick concrete walls. A glass wall stretches across the footwall of each room, opening onto a Zen garden and a plush vertical garden. Traditionally, radiation treatment centers are placed below ground to accommodate heavy equipment and to shield radiation. These spaces serve a very functional purpose and are typically barren of natural light and amenities that support the psychological and emotional needs of cancer patients. Kaiser Permanente did not want to build that type of facility. Instead, the health system sought to create a state-of-the-art medical center that brought its oncology radiation services above ground and into the light. With nearly 30 years of experience in healthcare planning and design, Carlos Amato brings significant thought leadership around the future intersections between design, planning, and technology to his role as Healthcare Principal. His passion for advancing innovations in both design and care delivery is evidenced in his collaborations with leading healthcare institutions and in his mentorship of the next generation of designers through leading CannonDesign’s Healthcare Fellowship. As part of CannonDesign’s healthcare leadership core team, he currently co-leads the firm-wide Surgery/Interventional/Radiology Subject Matter Expert Teams initiative. He has been the Medical Planner multiple large-scale healthcare projects of over a million square feet and was the project director and principal planner for the UCLA team that pioneered designs for digital radiology environments. He earned his Master’s degree in Architecture from Tulane University and holds a bachelor’s degree in Architecture and Urbanism from Universidad de Belgrano in Buenos Aires, Argentina.